Think about the one observation you believe to be true that hasn’t been discovered yet, and then pursue that missing gap. Oisin Hanrahan, co-founder and CEO of Handy, joined MBA students and alumni for a 2016-2017 Speaker Series event. Professor Luke Williams moderated the one-on-one interview, followed by an open Q&A session. Handy, a New York-based company founded in 2012, is a platform that connects individuals looking for household services with top-quality, pre-screened independent service professionals. In Hanrahan’s view, “Every startup has to figure out how their story is relevant to their mission.” In the case of Handy, it was finding a convenient and easy way to match their customers to trusted professionals. Does anyone care about what you're doing and selling? Are you going to win the category? Will your company be the largest player in the market you compete in? Can you build a long-term sustainable business? Hanrahan also touched upon Handy’s innovative marketing techniques that effectively communicate the company’s story and attract new customers, including subway advertisements. He noted the ads were a perfect opportunity to increase brand awareness and tap into their target market. Don’t fight the big waves of disruption. 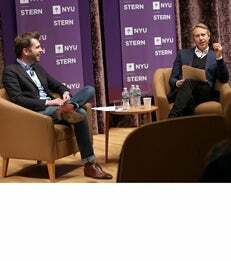 This Langone Speaker Series event was co-hosted by Stern's MBA Stern's MBA Office of Student Engagement & W. R. Berkley Innovation Labs.